I listen to quite a few enhanced podcasts, many of them include links in each of their chapters. Unfortunately iPhone OS hasn’t supported those links, even though it has a full web browser. 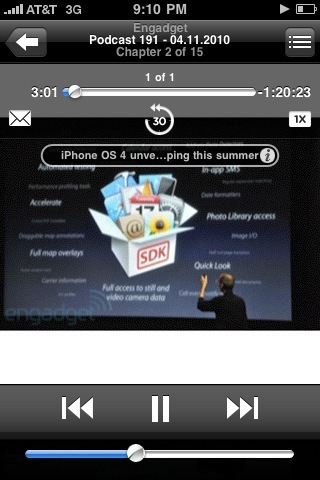 But, with iPhone OS 4 links now appear when listening to enhanced podcasts. 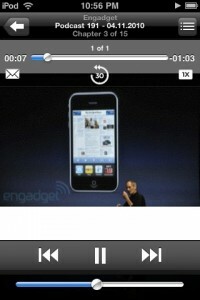 The image on the left is an iPod touch running iPhone OS 3.1.3 playing the most recent episode of the Engadget podcast, the image on the right is an iPhone 3GS running OS 4 playing back the same podcast. The first change is that the progress bar now shows the entire podcast length, not just the current chapter. The chapter selector can still be accessed by tapping the track list button (although currently, selecting a track crashes the app). But, there is new info button below the playback controls, tapping on it takes you into Mobile Safari to visit the web page linked to by the current chapter.